This wallpaper is still in beta stage. -_- Yeah, I faked jetlag from comming back from D.C. so I didn't have to go to school. xD Smart, no? This wallpaper was created pretty fast, about 5~8 hours. The fence is really a freak of nature. I was very subtle on sun rays because I was an idiot and looked at one myself. Stuupid Auralis. Its spring here in California and I'm making an autumn wallpaper. I didn't really want to add that much detail on the trees and bushes because it will distract the overall image in the wallpaper. Comments and favs are appreciated. O.O wow this wall is nice! like the monotone colors (is that correct term?) used in wall. scan is a great choice to go with the bg. it looks awesome for a wall made in so little time! oO hmm...the fence looks like a row of tombstones or something XD but no worries, it still looks amazing! Waaww...very very nice job! 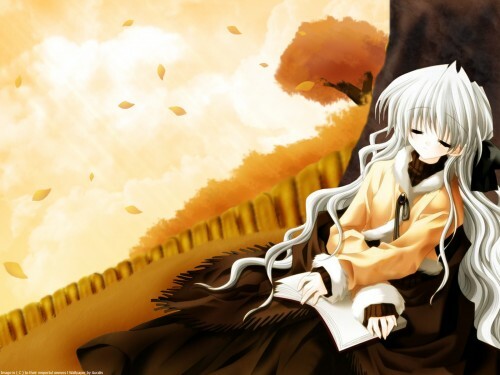 !I like the girl sleeping under the tree and in autumn too! !Two thumbs up! what a peaceful and beautiful autumn day, I rather like the details to the background with this piece, wonderfully cute idea for the whole thing.